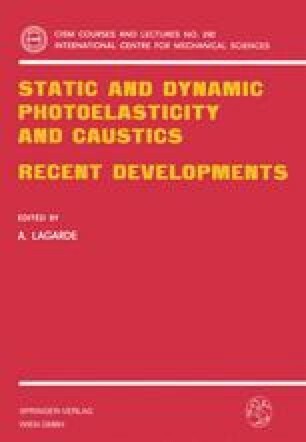 The shadow optical method of caustics is a relatively new experimental technique in stress strain analysis. It was introduced by Manogg1,2 in 1964. The method is sensitive to stress gradients and therefore is an appropriate tool for quantifiying stress concentration problems. Manogg originally used the method for investigating crack tip stress intensifications. The technique was extended later by Theocaris3–5, Rosakis6,7, and the author and his colleagues8–11 to different conditions of loading, material behavior, in static as well as dynamic situations. Shadow optical images of test specimens under loading in general are characterized by very simple geometric patterns which can be easily evaluated. Because of the simplicity of shadow patterns, the method can also be successfully applied for investigating rather complex phenomena, for example transient problems. Despite the complexity which may be inherent in the problems to be investigated the clearness of the generated recordings allows the derivation of reliable informative data. The author and his colleagues have applied the caustic technique to investigate various problems of practical interest in the field of fracture dynamics, in particular to the behavior of propagating and subsequently arresting cracks and the behavior of cracks under different impact loading conditions.